Little loss to the small screen. Routine Schwarzenegger fare translates to TV without much lost. Underneath "The 6th Day's" Schwarzenegger schmaltz of expensive explosions, showpiece stunts and utterly extraneous jet-helicopter chases, there's an intelligent cautionary thriller about science run amuck which has been trampled to death. 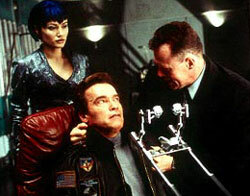 Taking place in a future that is "sooner than you think" -- a high-gloss world of virtual girlfriends, self-driving cars and illegal cloning -- the plot is basically a rehash of "Total Recall" in which Arnold plays a seemingly average joe whose life is turned upside-down by the cogs of a giant conspiracy. Schwarzenegger is Adam Gibson, an oh-so-suburban dad who owns a souped-up helicopter charter service. On the day he's been hired to drop a paranoid billionaire (Tony Goldwyn) on a mountain top for a day of skiing, Adam switches chopper duties with his business partner (Michael Rapaport) so he can go to the mall and get a RePet -- a genetic copy of the family dog -- before his daughter finds out the critter died. He returns home that night to discover he's been replaced by a duplicate. Another Adam Gibson is in his house, kissing his wife, hugging his kid and blowing out the candles on his birthday cake. Of course, it isn't long before Adam's on the run from leather-clad assassins and trying to figure out just what the heck is going on. The answer is this: Drucker, a greedy and evil billionaire, has secretly perfected the process of human cloning so he can, among other things, replace terminally-injured quarterbacks on his XFL team. Something happened on his ski trip -- we're shown flashes of an assassination attempt -- and some cloning was required in order to cover it up. Drucker thought Adam was his pilot so he used DNA and brain scan information gleaned during a "drug test" to Xerox our hero. Now Drucker has to kill one of the Schwarzeneggers to keep his secret safe. Peeking out from behind the action movie facade are several half-formed, high-minded notions for a much deeper story about scientific ethics being outpaced by scientific advancements. There are anti-cloning fundamentalists, disquieting concepts like adult-sized "blank" embryos for cloning (just add DNA) and clever touches like the fact that one character drives a beat up old VW Bug -- a beat up old 1999 VW Bug. But the few glints of promise in "The 6th Day" are lost in the blinding flash of Hollywood overproduction. Director Roger Spottiswoode ("Tomorrow Never Dies") jettisons the movie's brainy elements in favor of video game action scenes, showy techno editing, maniacally giggling henchmen and whorish product placement. The movie opens in the middle of an XFL game (that's the wrestling-meets-pro football "sport" NBC and the WWF are trying to launch) and in the first 10 minutes Chevrolet, OnStar (computerized car navigation) and three or four other brand names have not only been prominently featured on the screen, but worked into the plot. What's worse, "The 6th Day" takes itself so seriously it's almost impossible to just check your brain at the door and have some B-movie fun. The picture opens with a quote from Genesis on a black screen. Get over yourselves! Remove the commercialized Arnold element from this film, give an eccentric director like David Cronenberg, David Lynch or Darren Aronofsky ("Pi," "Requiem for a Dream") a crack at it, and "The 6th Day" might have had some integrity. As it is, however, the only truly entertaining part of this movie is the fact that Schwarzenegger keeps killing the bad guys and they keep coming back as really pissed-off clones.